Join the Tweetstorm on August 8th here! Known as the smallest, and rarest dolphins in the world the Maui’s Dolphins are facing extinction if extreme actions are not taken quickly by the New Zealand Government. Today less than 20 breeding females and a total population of 55 remain off the West Coast of New Zealand’s North Island. These shy dolphins swim in the shallow water making them vulnerable to legal fishing, illegal fishing (inside their protected area), and other human activities. Unless IWC recommendations are met, their protected area immediately expanded, and fishing practices restructured there is little chance of the Maui’s Dolphins surviving. International Whaling Commission asks NZ Government to act now to save world s rarest dolphins! New Zealand’s Department of Conservation announced that the number of Maui’s dolphins over the age of one has reached a historical low of between 48-69 individuals, with a mostly likely point estimate of 55 New Zealand shamed over Maui’s inaction July 2013. The International Whaling Commission has asked the New Zealand government to ban set net and trawl fishing in all areas where Maui’s dolphins are found immediately. Since 1970 when gillnet fishing first began the population has fallen 94%. 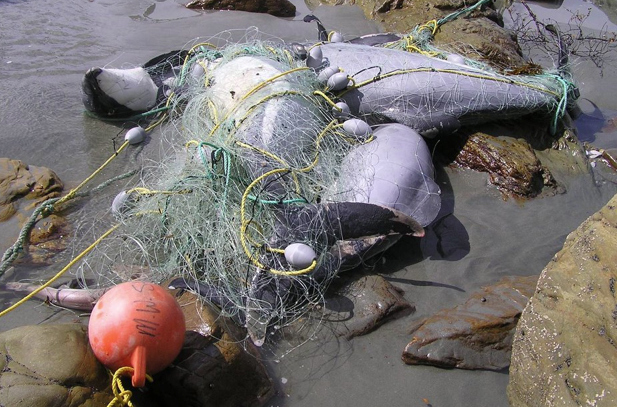 Gillnets are walls of nylon mesh that are stretched for miles in the water. The nets are constructed of unbreakable nylon, and designed in such a way that ocean life once entangled cannot back out. Gillnets do not discriminate. All and any marine life can become entangled. For the Maui’s dolphins that has meant painful and slow drowning, as they are unable to free themselves to return to the surface for air. Trawlers known as the death ships are another threat to the Maui’s as they indiscriminately drag the ocean floor killing anything caught in the huge moving net. The newest threat to these shallow water dolphins is seismic testing. Underwater explosions of air can reach levels of 230 decibels causing temporary and sometime permanent hearing loss that can result in death. Make no mistake that these beautiful dolphins are well on their way to doing a dodo, and the New Zealand government is well aware of this. ‘Unless something happens immediately, and the New Zealand Government takes notice, the only place you’ll find a Maui’s dolphin will be stuffed in a museum. What can you do to help the Maui’s dolphins? Join the worldwide online event a Tweetstorm for Maui’s dolphins August 8th at 7:00 AM EDT! People from all over the world are going to bring their Tweets together to spread awareness, expose the fish industry, and gain the attention of the New Zealand Government compelling them to take action for the Maui’s dolphins. 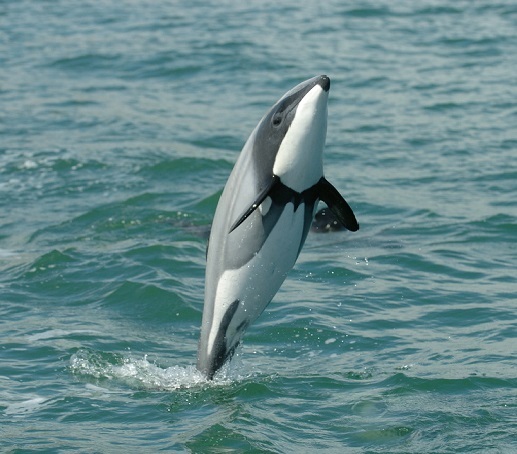 Until the New Zealand Government and corrupt fishing industry take action to save the Hector and Maui’s Dolphins do not purchase any seafood caught in New Zealand! Your voice, your Tweet, is their only hope! This entry was posted in Cetaceans, Dolphins, Hector's and Maui's dolphins and tagged dolphins, Hector's dolphin, Maui's Dolphins, North Island by Kirsten Massebeau. Bookmark the permalink. I will look ask WordPress and let you know! Take a good hard look at yourselves. Fishing is not reducing the “Maui’s” population, rather, take note of the latest finding of Toxoplasmosis. If you are serious about saving a dying population you had better join up with Gareth Hughes and eradicate all cats. Do you expect me to buy fish imported from Vietnam and other countries were the fish are farmed in sewerage infested waterways. I think you need to take a serious look at what you are saying. A rare dolphin is on the verge of going extinct yet you are putting your needs first. I ask you to consider the needs of the children and the ocean who if you are allowed to continue using gillets and trawlers for fishing (which should be banned worldwide) the Maui’s and Hector’s dolphins will be gone forever. The greed of man is destroying our oceans. Please rethink your life plan.